Legendary science fiction author Orson Scott Card calls Brandon Sanderson a writer to watch. 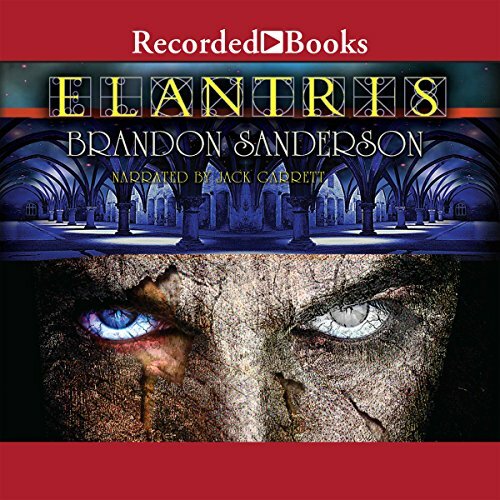 Elantris is Brandon Sanderson’s first widely distributed book and is named after the ruined city of Elantris, which is the focus of the story. 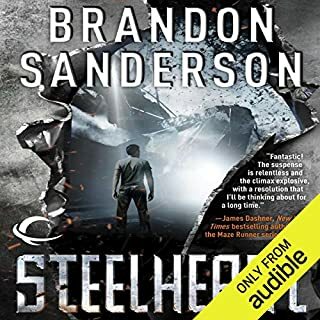 It is an excellent book and a complete story, despite the fact that Brandon does plan to eventually write a sequel. Within Arelon an affliction known as the Shaod transforms certain individuals into an undead state where one’s body no longer repairs itself. Arelon society treats anyone afflicted with the Shaod as dead and sends them into the ruined city of Elantris for the remainder of their existence. Elantrians feel pain and it is a pain that will never go away or diminish as they have no ability to heal. Over time, an Elantrian will accumulate injuries, each time adding to the level of constant pain they feel. Eventually, many go mad from their suffering. 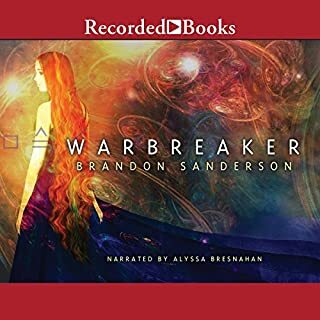 Within the walls of Elantris, a desperate, broken society has formed where the strong prey on the weak and the existing inhabitants take advantage of the newcomers sent to join them. 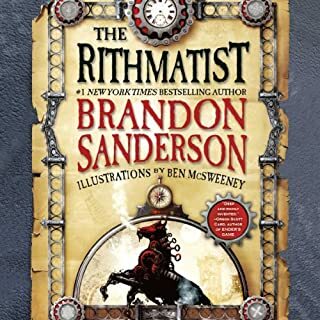 Raoden, the Prince of Arelon, is taken by the Shaod and thrust into the living hell that is Elantris; however, he refuses to abandon his humanity and seeks to improve the state of affairs within Elantris. 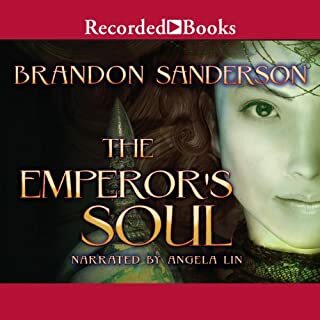 Brandon’s concept for this book, while basic in nature, is told within a setting that contains interesting magics and complex politics. Jack Garrett does a fine job as narrator and felt like a good fit for the material. I very much enjoyed this book. Even though it was long, it didn't feel like it. There were times I found myself laughing out loud and others where I almost wanted to stand up and cheer (or cry). I think this is intended to be the first in a series of books, but it ends in a way that you'll be OK until the next one is released (if there even is a next one). I see where/how a sequel could take off, but this is a very stand-alone book. Again, listening to the audio version saved me from having to try to come up with pronunciations for all the unique language/names in the text. The narrator did a fabulous job! While there is a certain amount of magic and "fantasy" in this fantasy novel, it features deep and complex characters and relationships, as well as a well developed plot that is entertaining, often unpredictable, and always leaves you wanting more. Sure, you'll find a few things as progress through the story that make you say "I totally saw that coming!" But, those instances will be come lost amongst the many twists and turns you never expected, but which all add up to make this a very rich and satisfying entertainment experience! If I owned the actual book and not the audiobook I would classify this as a real page turner. This is one of the most original pieces of fantasy literature that I have had the pleasure of reading in a long time. The magic system, religions and cultures, while not totally unique, have enough of a twist on them to keep the story interesting. The book is not as complex as some other books in the fantasy genre but its simplicity is, in a sense, refreshing. Brandon does a superb job of helping the reader feel like they are part of the story. Once I started listening I just couldn't stop... I found myself looking forward to driving to and from work so I could listen to the book... once I arrived at my destination I found myself sitting in the car for those few extra minutes just to hear what was going to happen next. Since listening I have purchased it as a gift for my two brothers and will be buying it for my nephew this Christmas. A book for lovers of good books. I thoroughly enjoyed this book. I found the ideas refreshing and the world the book encompasses to be masterfully crafted. I felt the narrator did a wonderful job and his tone matches the tone of the story nicely. While this novel is written with an adult audience in mind it is appropriate for teens and well enough told that they will be able to follow it. I've been an audible member for 2 years and listened to audio books for close to 15 years. This is one of only a very small number of books that have impressed me enough to write a review. Regardless of your favorite genre this book is a great listen. I definitely found it "credit worthy". Give it a listen. I didn't know this was the author's first novel until after I'd purchased it and started listening. For his first run he's done an impressive job. Yes, the ending is fairly predictable but how it gets there is not. He does a great job of keeping the story moving and I found myself actually hoping for more traffic on the way to/from work so I could listen a bit longer. The only reason I gave it four stars instead of 5 is the narrator. He speaks very VERY slowly. I've purchased several books on audio and this is the only one I've had to speed up to "fast" on my iPod. Other than that I would highly recommend this book. I'll definitely be adding the Mistborn trilogy to my library shortly. I've listened to this 3 times now & still love it like the first. I would absolutely recommend this book! I really enjoyed this book. I normally listen to audiobooks for about an hour and a half a day, during my commute to and from work. About 2/3 through Elantris, I started carrying my mp3 player with me and couldn't stop until I'd finished it. I would highly recommend this book. Absolutely. 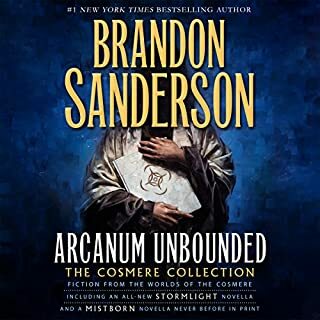 It is another interesting world from the mind of Brandon Sanderson. His magic systems are always so well developed and his cultures are intriguing. I would recommend reading it instead of listening to it. What other book might you compare Elantris to and why? The plot was not my standard fare, so I am not sure I have a good comparison. Who would you have cast as narrator instead of Jack Garrett? James Marsters, Michael Kramer, and Kate Reading always do phenomenal jobs with their books. I really don't know how they can vary their voices in so many ways for the different characters. The narration just about killed the entire book for me. I almost quite listening before I made it through the first few chapters. 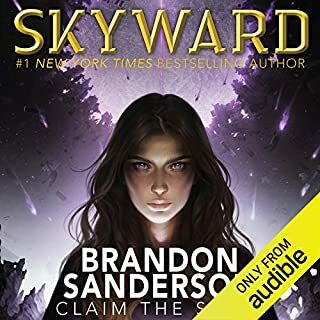 I stuck it out because it was by Brandon Sanderson and the plot eventually pulled me in more than the narration pushed me away. I felt there were irritatingly long pauses at weird points in the sentences. The book could probably have been read in 3/4 of the time it took him. A great book with good character development. I really liked the combination of the main storyline mystery, set within the environment of the political conflicts. It lead to a good complex story overall. I also really liked the reader, he was very easy to listen to. I mostly listen to more modern science fiction but I may be turned by this book! I will likely try another Sanderson novel. This is a great debut novel. You will notice I say debut. It cost a credit and takes over 27 hours to listen to. So, do you spend the money and the time on a little less polished work. Personally, I am a fan of Sanderson and for that reason I find it important to read his first work. If you are not familiar with Sanderson, I would suggest you start with Mist or The Way of Kings. I love the magic system or shall I say the broken magic system. Being broken makes this book different from others of the same genre. I love the characters. Prince Raoden is the main character. I like him cause he is a true leader and he is able to stay optimistic. He seems to be a precursor to Dalinar in The Way of Kings. Both face what seems insurmountable situations, but through determination, optimism and leadership skills, control their destiny. The afflicted in this story, get hurt and never quit feeling the pain. Raoden stubs his toe and for the rest of his life he will feel the pain of the initial stubbing of the toe. You break your back, your legs, your arms, it never heals and you feel the pain for the rest of your immortal life. Sarene is a Princess who is six feet tall. Men don't like women taller then them and most men are less then six feet. She has learned to deal with this and she is very smart, but can also be a little callous. Being smart and being tall are two strikes against her. It bothers her, but not enough to keep her from being her. Galladon is another interesting character who is often pessimistic, but he is a really nice guy. The Seon is cool and the Derethi Monks quite evil. I could not give this a fifth star, due to a few things. Their was a lot of politics and a lot of name dropping. These parts were long and boring. At times the book gets kind of Ayn Randish with it's thinly veiled preaching. Since Dune, every author feels the need to invent a good religion. This religion is different in that it is all about ambition and is even described as militaristic. It is very similar to the Catholic Church in it's makeup. It has a Pope like person at the top of the church and then ranks of bishops and priests, only called by a different name. While this was interesting in structure, their was too much about the inner workings of the church that were boring. I must admit that I put the last eight hours on 2x. I did not want to quit, cause I wanted to see how it ended, but was getting a little bored. The ruling system was set up strictly on capitalism. The richest man in the land becomes the king. Sorry, Trump, but according to BS, this is not a good system. A good business man does not make a good ruler. In this case the ruler is supposedly paranoid, but does not use spies and seems fairly naïve about what is going on in his kingdom. The narrator did just fine. Some have said he was slow and toward the end I put him on 2x, but I believe he was reading it the way it was written and had he speed up, he would have been accused of going overboard.